Taking a history. Examination of the patient. The clerking. Chest pain. Shortness of breath. Palpitations. Cough and haemopytsis. Pyrexia of unknown origin. Dyspepsia. Haematemesis and melaena. Change in bowel habit. Weight loss. Jaundice. Abdominal pain. Urinary symptoms. Haematuria and proteinuria. Hypertension. Headache and facial pain. Joint disease. Back pain. Skin lesions and rash. Loss of consciousness. Confusional states. Stroke and transient ischaemic attack. Lymphadenopathy and splenomegaly. Sensory and motor neurological deficits. Vertigo and dizziness. Excessive bruising and bleeding. Anaemia. Cardiovascular system. Respiratory disease. Gastrointestinal and liver disease. Genitourinary system. Central nervous system. Metabolic and endocrine disorders. Musculoskeletal and skin disorders. Haematological disorders. Infectious diseases. Drug overdose and abuse. Self-assessment. 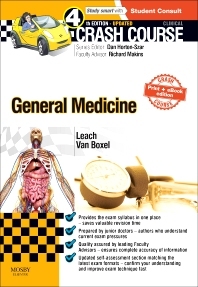 Building on the success of previous editions, this new volume provides a concise account of the broad range of general medicine from the most salient features of history taking and clinical examination to investigations and further management. The staggering progress of medicine and the relentless growth of information available can be daunting – included here are carefully selected key developments from recent years most relevant to your course and modern clinical medicine. This clear overview will prove invaluable throughout your undergraduate years, leading up to your finals exams and well in to your first years of practice.